Since my last blog many things have been going on. I started and finished a painting for the Delaware Waterfowl contest. This is my first attempt to enter this contest. I began using the air brush and liked the effect this gave me. I, also, began a painting for their trout stamp contest. I placed in this contest a couple of years ago. Wish me luck. The “Gettysburg” painting is on hold for a brief time. An article in the Leader Times come March will feature my “ugly old puss” working on the painting. I have spent some preperation hours here and at the museum in Kittanning, Pennsylvania. I have been completing some projects for the “Indian Room” as well as painting some images on the walls. The opening is to be in April of this year. Many items are made in my basement and added at the museum upon completion. 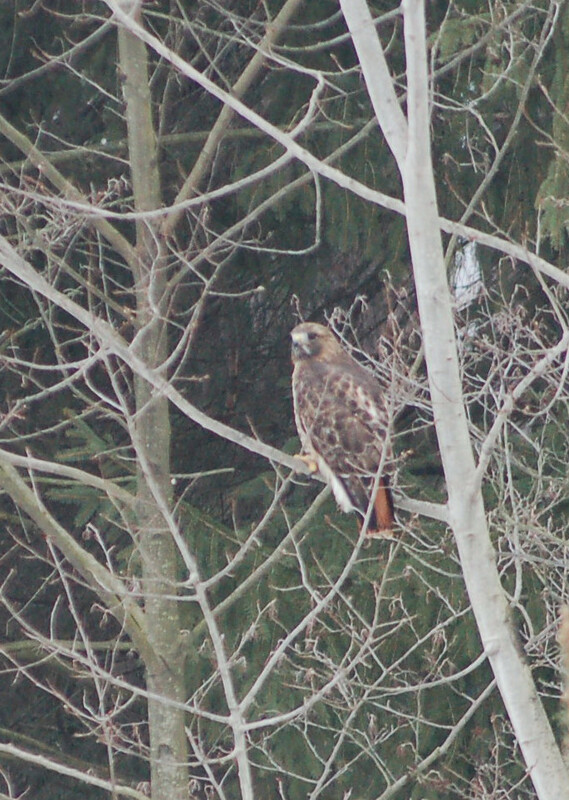 As I type this blog I am blessed to be able to watch two red-tailed hawks feeding on the deer ribs. (see December 17 blog)I have been having trouble getting quality photos of them. Earlier today, I took a number of photos. Most were blurred. I think I may need to have my eyes checked. The images appeared clear and crisp, but once observed up close on the computer screen I see very slight blurriness. I will include one here. I spent Friday evening at the Armstrong County League of Arts. I went to observe their “Hoe-down” square dance and ended up playing guitar most of the evening.